They were... Socialist Invaders from the Future! 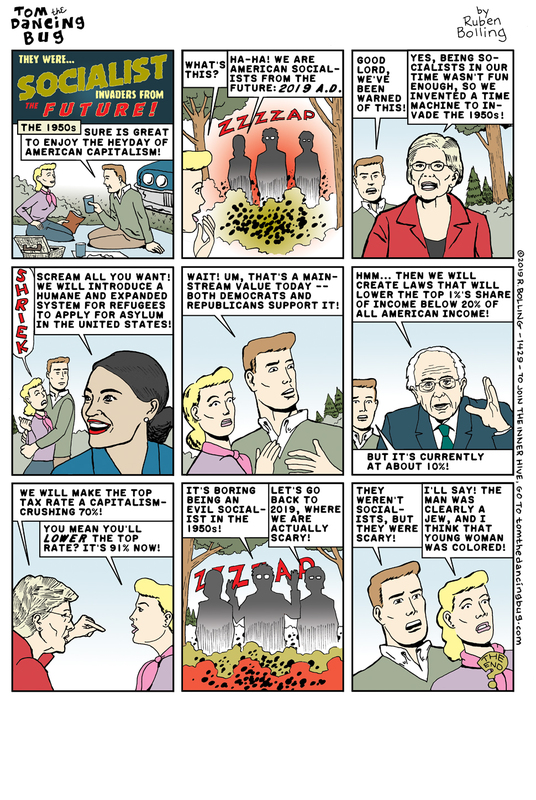 Tom the Dancing Bug, IN WHICH scary Socialists from 2019 invade the 1950s to spread their evil brand of radical collectivism. RESIST! … the temptation to fail to JOIN Tom the Dancing Bug's subscription club, the Proud & Mighty INNER HIVE, for exclusive early access to comics, extra comics, and much more. GET Ruben Bolling’s new hit book series for kids, The EMU Club Adventures. “Ruben Bolling is one of my cartooning heroes, and The EMU Club Adventures is seriously, mysteriously funny! - Jeff Kinney, Diary of a Wimpy Kid -> Book One here. - Book Two here.